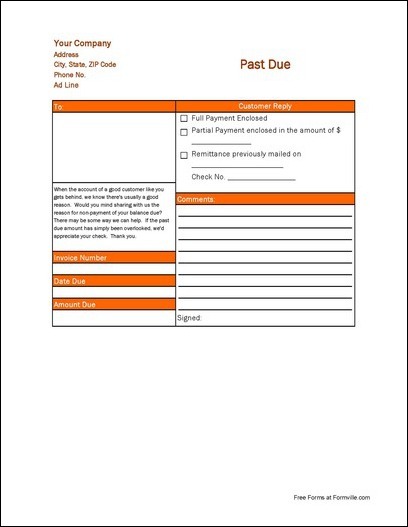 Form Description: Notice of past due status of a bill or invoice. This is generally an intermediate step between a bill reminder and a final notice. Includes a friendly reminder and request for payment and/or explanation, account information, and a customer response section for remittance of payment and comments. This form is in full-page portrait format. You can download a PDF version of the "Bill Reminder Second Notice" form absolutely free. You can also, for a small payment, download a fully editable version of the form that you can customize as you desire. (Don't know which format to choose? Here's how to make your choice.) What would you like to do? Formville's free "Bill Reminder Second Notice" form is associated with the following keywords: accounts receivable, dunning.